Summary and Definition: The Sioux tribe fiercely resisted the white encroachment of the Great Plains. The names of the most famous chiefs who led the Sioux tribe into battle were Sitting Bull, Red Cloud, Chief Gall, Crazy Horse, Rain in the Face, and Kicking Bear. Famous conflicts included the Sioux Wars (1854 - 1890), Red Cloud's War (1865–1868), the 1876 Battle of Little Bighorn and the 1890 Ghost Dance turmoil. What was the lifestyle and culture of the Sioux tribe? The Sioux tribe were famous for their hunting and warrior culture. Warfare was a central part of the Plains Indian culture which led to inter-tribal conflicts and violent clashes with the white settlers and the US army. Siouan men were noyed for their great courage and physical strength. They were a nomadic tribe who roamed the Great Plains hunting the buffalo (bison). The buffalo provided the tribe with everything they needed - food, clothes and their tepees. The Siouan men wore face paint for religious ceremonies and, more famously war paint in times of war. War Paint was used to make Sioux warriors look ferocious and the designs and colors that were used were believed to hold magical powers of protection. The name Sioux derives from the Siouan word 'Nadowessi' meaning "Little Snakes". The Sioux nation ((Hocak Saha)) were the largest of all the Native Indian tribes and consisted of three divisions which were based on their location, dialect and their subculture. The Sioux tribe originally lived as Woodland Indians along the upper Mississippi in Minnesota, Iowa, and Wisconsin. The were forced west by the French and their Chippewa allies. During the migration west to the Great Plains the tribe split into three divisions - the Lakota, Dakota and Nakota. The names Lakota, Dakota, and Nakota all mean "Allies" or "Confederates." 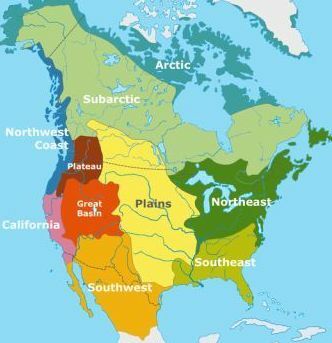 Where did the Sioux tribe live? The Sioux are people of the Great Plains Native American cultural group. The location of their tribal homelands are shown on the map. The geography of the region in which they lived dictated the lifestyle and culture of the Sioux tribe. What did the Sioux tribe live in? The Sioux tribe lived in tent-like homes called tepees. The tepee was constructed from wooden poles that were covered with durable animal skins such as buffalo hides. It was pyramid shaped, with flaps and openings, rounded at the base and tapering to an open smoke hole at the top. Tepees had few furnishings. Buffalo hides were used for seating, bedding, and covers. A hearth was built in the center of the tepee for cooking and heating. Most tepees were approximately 12 to 16 feet in diameter at the base. This type shelter suited the nomadic lifestyle of the Sioux tribe. A tepee was quick to erect and easy to dismantle. A Siouan village could be ready to move within an hour. What language did the Sioux tribe speak? The Sioux tribe spoke in the Siouan language. What did the Sioux tribe eat? The food that the Sioux tribe ate included the meat from all the animals that were available to hunt: Buffalo, deer, elk, bear and wild turkey. These were supplemented with roots and wild vegetables such as spinach, prairie turnips and potatoes and flavored with wild herbs. Wild berries and fruits were also added to the food available to the Sioux. When animals for food was scarce the tribe ate dried buffalo meat, called pemmican. What weapons did the Sioux use? The weapons used by the Sioux tribe included bows and arrows, stone ball clubs, jaw bone clubs, hatchet axe, spears, lances and knives. War Shields were used on horseback as a means of defence. The rifle was added to their weapons with the advent of the white invaders. The women of the Sioux tribe were responsible for making the articles of clothing worn by the people. Most items were sewn from soft, tanned skins of deer (buckskin) and buffalo. Clothing was often decorated with paint, porcupine quills or beadwork. Sioux clothing for both men and women were adorned with ornaments, especially necklaces and armbands. What clothes did the Sioux men wear? Many of the clothes worn by the men of the Sioux tribe are illustrated in the pictures on this site. The clothes worn by the Sioux men consisted of breechcloths, fringed buckskin tunics or shirts and leggings. Warm buffalo robes or cloaks were also worn to protect against the rain and the cold. The adult Sioux men also wore beaded, feathered war bonnets decorated with eagle feathers, ermine fur and beadwork as a symbol of honor and accomplishment. The Sioux wore a trailing bonnet with feathers trailing to the floor. What clothes did the Sioux women wear? The type of clothes worn by the women of the Sioux tribe were knee-length dresses and leggings. The women also wore the buffalo robes to keep warm and dry. The dresses of the Sioux women that were used for special occasions were elaborately decorated with beads and painted with signs and symbols that reflected their tribal identity and family values celebrating acts of valor by their men or sacrifices made for the well being of the family and tribe. Sioux women wore their hair in two, thick braids decorated with beads. What was the religion and beliefs of the Sioux tribe? The religion and beliefs of the Sioux tribe was based on Animism that encompassed the spiritual or religious idea that the universe and all natural objects animals, plants, trees, rivers, mountains rocks etc have souls or spirits. In Lakota Sioux mythology, Chapa is the beaver spirit and and symbolizes domesticity, labor and preparation. The Great Plains tribes such as the Sioux believed in Manitou, the Great Spirit. What were the rituals and ceremonies of the Sioux tribe? 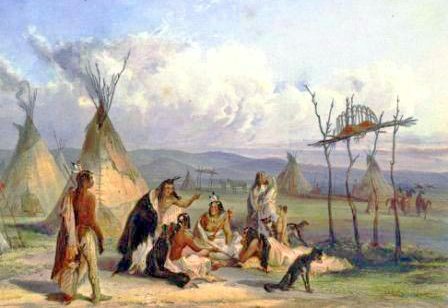 The rituals and ceremonies of the Sioux tribe and many other Great Plains Native Indians, included the Sweat Lodge ceremony, the Vision Quest and the Sun Dance Ceremony. The sacred, ceremonial pipe (called a Calumet), was ritually filled with tobacco was passed among participants at all sacred ceremonies of the Sioux. The Calumet, was often used to seal a peace treaty, hence the term 'Peace Pipe', but it was also used to offer prayers in religious ceremonies and in war councils. Who were the most famous leaders and chiefs of the Sioux tribe? The most famous leaders and chiefs of the Sioux tribe included: Sitting Bull, Red Cloud, Rain in the Face, Chief Gall, Crazy Horse, Kicking Bear, American Horse, Black Elk, Chief Lone Horn, Chief Touch the Cloud and Chief Big Foot. The following history timeline details facts, dates and famous landmarks and battles fought by the Sioux Nation. The Sioux tribe fought on the British side in the War of Independence and in the War of 1812. Sioux History: What happened to the Sioux tribe? The 1887 Dawes General Allotment Act led to the break up of the large Indian Reservations and the sale of Indian lands, including Sioux lands to white settlers. The last major conflict fought by the Sioux was the 1890 Battle of Wounded Knee which resulted in the massacre of more than 200 members of the tribe. The U.S. imposed forced settlement of the Sioux on a reservation. The Sioux people were required to settle on eleven reservations - nine of which are in South Dakota that today make up the Great Sioux Nation. For additional facts and information refer to the legend and the Story of the Sioux War, the Story of Sitting Bull and the Story of Red Cloud.